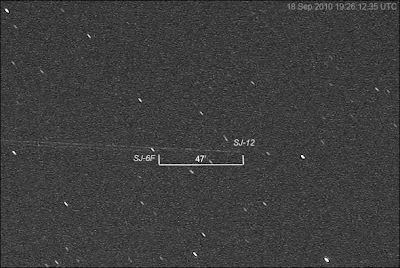 On August 19th, two Chinese unmanned spacecraft, Shijian SJ-6F (08-053B) and SJ-12 (10-027A) , met in space for what seems to be a deliberate rendez-vous, perhaps even involving physical contact between the two objects. 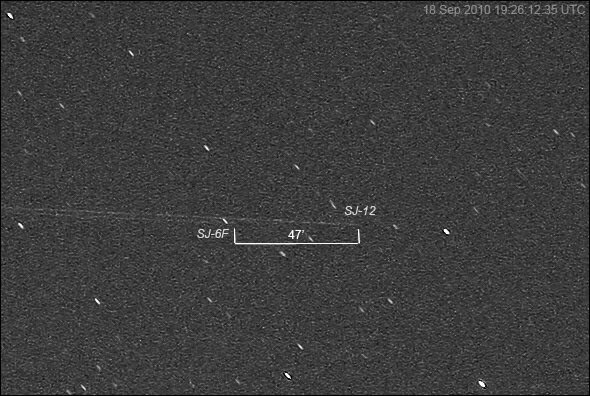 For a complete review of what happened, and all the speculation rife about the possible background, see Brian Weeden's article in The Space Review. One major concern of some, is that this could be a test of technology to "attach" a satellite to other satellites (or at least bring it very near), as part of ASAT technology. Whatever the reason may be: the two objects are still cruising close together. Last Saturday evening, when bad weather shortly gave away to clearings, I shot an image of the couple while they were cruising through Corona borealis on a western evening pass (not the best of conditions). 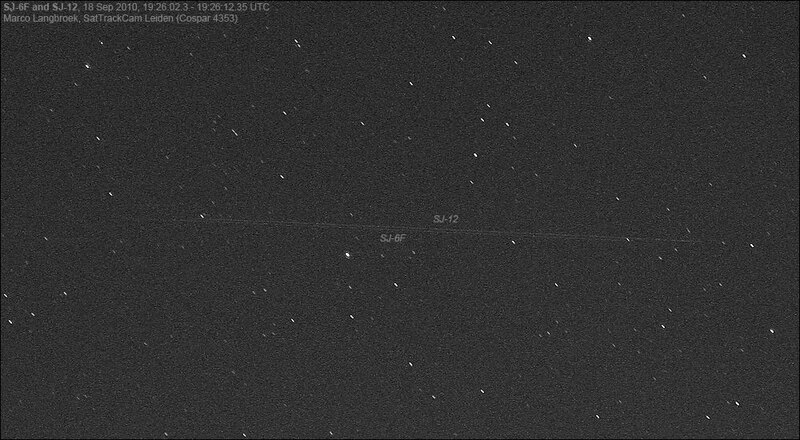 The trails on the image are faint, but you can see well that the two are close (separation between the two satellites was 0.78 degrees on the image). SJ-12 is the leading one, SJ-6F the trailing one (movement in the image was from left to right). 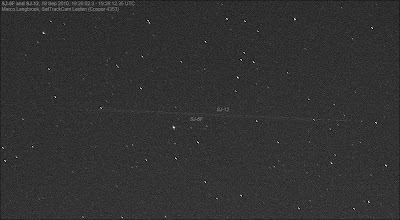 As the distance of both spacecraft to the observer was 812 km at the time of the observation, a quick calculation on the back of an envelope shows that the 47' separation on the image is equal to about 11 km separation between the two objects. That is still close!